Modern dentistry has put special attention on training its professionals to handle apprehensive patients with a variety of methods and treatments that can relieve pain and reduce fear in the dentist’s chair. Keeping these interests at heart, Morton Family Dental of Berwyn located at 6931 W Cermak Rd, provides an array of personalized dental care services in a convenient, comfortable environment. 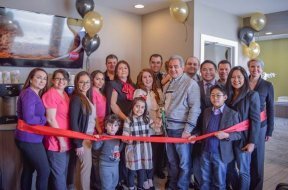 A new neighborhood source for family dentistry, the dental team held a ribbon cutting in partnership with the City of Berwyn and the Berwyn Development Corporation (BDC) on March 22, 2017. Morton Family Dental of Berwyn aims to be a one-stop-shop for dental procedures. Traditional dentistry might have patients making appointments with different providers for specialized services, but Morton houses the full range of dental services in one convenient location. The practice offers general dentistry (fillings, gum treatments, extractions), cosmetic dentistry (wisdom teeth, whitening, veneers), restorative dentistry (braces, root canal, implants, dentures) and more. For those seeking comfort, conscious sedation is available. What’s more, the practice utilizes cutting edge dental technology to deliver their services, such as digital and panoramic X-rays and 3D imaging, intraoral cameras and lasers. For more information on the Morton Family Dental of Berwyn ribbon cutting, contact the BDC at 708-788-8100. © 5535 Chicago Hispanic Newspaper, Lawndale News, Hispanic Bilingual Newspapers, Su Noticiero Bilingue. All rights reserved. XHTML / CSS Valid.